I’m glad for Sean Maguire that his character bit the dust this episode. When Robin Hood, one of the great, rakish heroes of all time, someone who should be swooping up women right alongside Captain Hook, is reduced to being a glorified blanket carrier for episodes, it’s like being on Once Upon A Time had him trapped in his own personal Underworld. When’s the last time Robin had his own plot—better yet, a plot that didn’t involve just traipsing along after Regina? His biggest moment on the show came when it found out he’d basically been fooled by Zelena impersonating his dead wife Marian. That’s a plot for a hapless type like Walter Mitty, not Robin Hood. See how much better Hook fared tonight by partnering with Arthur on an actual quest of his own, away from Emma. Once Upon A Time has often had fun with its legendary characters, then tossing us fun one-off episodes for recognizable names like Ariel, for example. When the show started, of course we wanted to see who was going to pop up next, when even the Jiminy Cricket psychiatrist had a Dalmatian named Pongo. Some characters, surprisingly stuck around (Cruella, Merida), while some disappeared without much of a whimper (Aurora, Tinker Bell). Some, like Red, continue to pop up occasionally. But for our core group of Scoobies, who are usually off on the trail of some Big Bad—and just like them, focusing their tactics on library research—it’s too much: Emma, Hook, Snow, Charming, Henry, Regina, and Robin spent too much time in the Underworld just standing around gaping at each other. Robin, and Maguire, deserved better. We all did. Especially when it came to his death scene. I’m sure CGI must be a tricky business, but the whole thing was staged so oddly. When Robin jumped in front of her to absorb the death ray, why would Regina just stand there dumbly, instead of screaming “Nooo!” or “Whyyy!” Once the scary piece of plastic worked its dark magic, the scene then shifts into these strange, gooey Lifetime-worthy close-ups of Robin and Regina, before Robin turns into some shimmery light like Patrick Swayze at the end of Ghost and then dissolves, with Regina standing there mutely the whole time. It’s so odd I feel like it must be a negative byproduct of the special effects, which is too bad because it definitely lessened Robin’s final moment. The CGI ghosts fare a lot better crawling out of the River Of Souls in an homage to yet another Disney product, Pirates Of The Caribbean. But again, the blocking was off: Arthur gets grabbed by a ghoul that is helpfully defeated with a simple torch, then turns his back on the river again straightaway so that another ghost quickly gets past him. Even outside of effects issues, this episode was, in Clueless terms, a Monet: pretty enough from the outside but a hell of a mess if you start to take a closer look. Although Greg Germann hung tight to his Hades portrayal to the very end, his motivation seems misguided. Why did he kill Arthur? (Which, in fact, turned out to be his undoing, as Arthur then teamed up with Hook in the Underworld to defeat him.) If Hades needs a kingdom, why stay in Storybrooke, where everyone knew who he was? Couldn’t he just go take over Denver or something? And Zelena went pretty quickly from being wary of Hades to being ready to defend him to the death. It was pretty funny that she just wanted to this modest little homelife, and Hades kept talking about how they were going to take over, and she protests, “Why do we need a kingdom? Why can’t we just get an apartment?” Hades is probably, more correct that Zelena with this plan: How could two such evil (or formerly evil) masterminds expect to just settle down in domestic bliss? So Zelena takes out her own boyfriend, but not without Robin succumbing to Hades first. At my Mother’s Day dinner (don’t want to brag, but I ate about a pound of crab legs at Red Lobster), the family speculated that Robin would be the one to die tonight. I said, “So then Regina will turn evil again.” My husband protested, “Naw, they’d never do that again,” but judging from the previews, looks like I was right. Which, if memory serves, is exactly what happened in season four, as Emma and Hook connect as they bring Marian to Storybrooke, ruining Regina’s chances with Robin. Thank you, show, for not pulling out this well-worn phrase tonight, but what does OUAT have against Regina’s happy ending anyway? 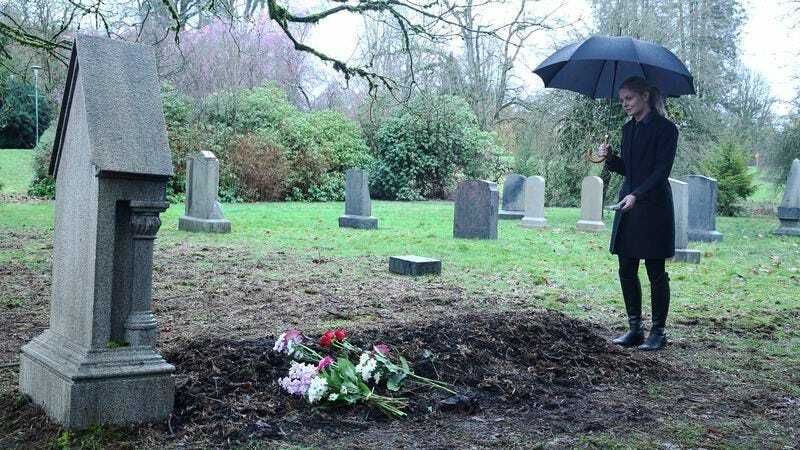 Speaking of happy endings, it was nice to see Hook and Emma’s joyous reunion at the cemetery (sorry for you all, mourners), but Hook’s logical explanation about his return is pretty easily waved away by the young Zeus being all-powerful or something. So now there are two Hooks, one rotting in that grave, and one walking around without a heart? Maybe Once Upon A Time works best when you don’t look too closely, not exploring its death scenes and numerous motivations of its characters. From that vantage point, this was a fast-moving episode with some high-tension moments, keeping the drama alive even in Storybrooke, a place that a lot of people now want to protect and apparently fight over. Like Rumple, so hell-bent on keeping command of his “kingdom” (although torturing Belle’s father hardly seems like a good way to get back into her good graces). He’s been laying pretty low in this Underworld arc, so while everything appears wrapped up, the two-part finale next week should offer some insight into what he’s really up to. But thanks to this episode’s strange effects lurches and plot craters—alongside the show’s waste of this character overall—Robin’s death didn’t resonate as much as it should have. This is the second death I’ve seen this season (Legends Of Tomorrow had the other one) where a villain gets turned into a pile of dust, and it’s just left there for someone else to vacuum up, to the eventual detriment of the heroes. Nice to see Arthur get some redemption at the end; you think he’ll run into Lancelot down there? See you for the two-part finale! OUAT usually excels at these, so fingers crossed for next week.